The Energy Efficiency Directive has set an objective to accomplish a reduction of 20% of primary energy consumption by 2020. Under article 8 of the EU Energy Efficiency Directive, all 28 EU Countries are required to introduce a scheme of regular energy audits for large companies and their corporate groups. The UK has presented The Energy Savings Opportunity Scheme (ESOS) as a major aspect of the prerequisites, the strategy is aimed at increasing energy efficiency which will improve profitability over the long term for many businesses and help with alleviating environmental change. The obligatory scheme requires all organisations with a substantial undertaking to experience an evaluation of energy use and energy proficiency opportunities across their sites that largely represent the majority of the total energy use of the organisation. DOES ESOS APPLY TO YOUR ORGANISATION? The ESOS regulations apply to any large enterprise that carries out a trade or a business, which includes any corporate group where one or more members of the UK group meets the ESOS definition of a large undertaking. Is part of a group that includes at least one of the above criteria? Charities and other not-for-profit bodies, if engaged in ‘trade or business activities’. In the event you qualify for ESOS but your organisation is completely covered by IS0 50001, you will be exempt from carrying out an ESOS assessment, but you will need to notify the Environment Agency that you are compliant with ESOS. 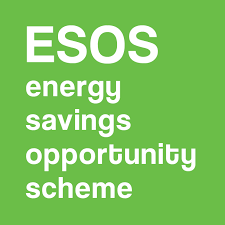 Appoint a ‘Lead Energy Assessors’ to administer the ESOS Assessment. Measure the total energy consumption for buildings, industrial processes and transport. Identify areas of significant energy consumption that account for at least 90% of total energy consumption. Identify practical energy efficiency recommendations for areas of significant energy consumption and assess and report the cost-effectiveness of each. Report compliance to the Environment Agency by December 5th 2015, after having the ESOS Assessment checked by a Board Level Director or equivalent Senior Manager and then approved by the selected Lead Assessor. ESOS Assessments must use a minimum of 12 months energy consumption data (including 31st December 2014) and show sensible proposals for the buildings being assessed, or make sure that there is no scope for cost effective energy efficiency improvement. The energy saving recommendations may take place in a different 12 month period. It is possible to use existing energy saving opportunities identified any time dating back to 6th December 2011 up until 5th December 2015. Assessments must incorporate at least one site visit, with the goal that suggestions are not simply hypothetical. Organisations with various comparative sites or resources can take a proportionate methodology, applying proposals from one review over the more extensive portfolio. Introducing a certified ISO 50001:2011 energy management system will also be viewed as a route to compliance with ESOS. To be valid, a participant’s ISO 50001 energy management systems must be certified by a United Kingdom Accreditation Service accredited certification body, by a body accredited by another EU member state’s national accreditation body, or by a body which is a member of the International Accreditation Forum. Display Energy Certificates (DECs) can also be used to contribute to ESOS Compliance for energy use in buildings providing they are undertaken and still valid within the compliance period. They will also be subject to review by the approved Lead Assessor. HOW CAN ESOS BENEFIT YOUR BUSINESS? From our experience we indicate that large businesses can cost effectively save around 15% of their energy expenditure through implementing efficiency measures. In many cases savings can be even higher. It is not uncommon to see savings as much as 30%. Our team of specialist energy consultants believe that if you act now, your business will be able to maximise payback and benefits of this mandatory compliance scheme. ESOS compliance bodies are authorised to apply civil penalties against any organisation or group found to be required to participate in ESOS and found to be non-compliant. Financial penalties upward of £50,000 for fraudulent/non compliance. To view the Department for Communities and Local Government ESOS requirements click here.